The main problem is that it’s not very well written, and it’s no surprise to read in the new introduction by Robert Macfarlane that the book was written “in ‘a matter of weeks’, with revisions being made only to the first chapter.” The opening scenes are full of people telling each other things for the benefit of the reader, and few of the characters are strongly distinguished – though there are a couple, such as the firearms store owner, Pirrie, who stand out. There’s an inevitably dated quality too (“There’s an awful lot of Chinks in China. They’ll breed ’em back again in a couple of generations”). 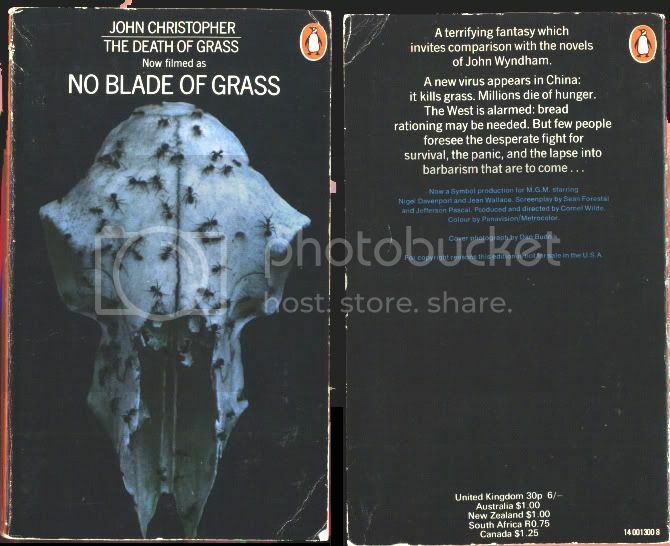 Nonetheless The Death of Grass is a gripping story. It might be considered a sort of prequel to Cormac McCarthy’s The Road – less evolved in both chronological and literary terms – as the world succumbs to a virus which kills off all grasses around the world and leads to the breakdown of civilisation. The main storyline details the attempts by one family to journey the length of England to find a safe haven in a relative’s farm. Their travels coincide with the swift development of barbarism and violence among the British people. There is plenty missing here: little description to evoke the image of a world without fields or crops, and only the odd reference to mass suicide or panic. There will be legends, he thought, of broad avenues celestially lit, of the hurrying millions who lived together without plotting each other’s deaths, of railway trains and aeroplanes and motor-cars, of food in all its diversity. Most of all, perhaps, of policemen – custodians, without anger or malice, of a law that stretched to the ends of the earth. Robert Macfarlane’s introduction places the book in the mid-20th century tradition of the ‘floral apocalypse’ story, detailing Triffids but also less well known examples as Thomas Disch’s The Genocides and Ward Moore’s Greener Than You Think (and, less obviously, it occurs to me, Brian Aldiss’s Hothouse). John Christopher, whose real name is Samuel Youd and who is in his 87th year, has written around 70 novels under several different names. Given his rampant – virus-like – productivity, the real surprise is that The Death of Grass is as good as it is. Interesting, I didn’t know of Disch’s The Genocides (though his The Trees, if I recall the title correctly, is remarkably depressing). I may read this as it’s been unavailable so long and is widely regarded, though I wouldn’t call yours a glowing review quite. Is it an easy read John? I don’t necessarily mind a slight lack of literary quality, but I do if it’s associated with excessive length or a turgid style. I missed that this had been re-released. Damn! Interesting review… Good stuff. I’d be really fascinated to look at it again, especially after reading this. So thanks! Is it an easy read John? A very easy read, Max, and just under 200 pages in length. (Even easier for me, in fact, as I read it in a spiral-bound proof copy which I could leave open on my lap or desk with no hands required. More books should be like this!) Any more info on Disch, by the way? My review is not glowing because the book is, as indicated above, not well written. However it does seem to me to be one of those rare examples where the functional nature of the writing does not interfere with the main qualities – the bleakness, the direction, the pace – and may even be helpful to them. Sam, it’s out today, and should be widely available. I think it will do very well, because as you yourself have pointed out, it’s a book many people recall from their youth – though I hadn’t heard of it until bloggers started raving about it in the last year or two. My only knowledge of Christopher’s work was his Tripods series, which will be known to many people around my age from the TV adaptation in the 1980s. It also of course has an environmental relevance which is in keeping with the times, as with the other recent Penguin Modern Classic sci-fi title, Make Room! Make Room! I’m sure we’re due a spate of a new apocalyptic novels like this, now that the world is melting down economically as well as environmentally. Following on from what you said about The Road, I’m reading Blood Meridian at the moment and in many ways it is the more apocalyptic and transgressive of the two novels, even if it has a historical premise. Most of McCarthy’s novels seem to take place on the threshold of civilisation: not the end of the planet itself but the end of eras, past or present. Very good review. It’s hard for me to see this book’s flaws as, like Sam, I read it first as a youngster, and it was the atmosphere and gripping plot that grabbed me. I still think it’s ace. Thomas Disch is well worth a look, but don’t start with ‘The Genocides’. His later work, like ‘Camp Concentration’, is much more layered, allusive and intriguing. ‘The Genocides’ is straight 1950s pulp about giant plants taking over the world, and a bunch of American farm-boy types trying to save themselves–like a more bumptiously American and less full-of-wonders version of ‘Hothouse’, in fact. I don’t know if you heard the serialised Radio Four dramatisation recently, but I felt it baldly exposed the rather clunky dialogue. I broadly agree with your conclusions. 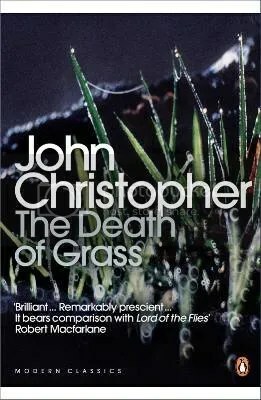 ‘The Death of Grass’ isn’t a literary masterpiece, but a highly accomplished work of popular fiction by a extremely underrated novelist. I hope that John Christopher will now begin to receive the recognition he deserves. Thanks for the comments everyone. Yes Tom, I thought the Guardian review was a bit effusive and likely to lead to dashed expectations. The Death of Grass is a good read and a worthy reissue, but it’s futile to pretend that it’s flawless. I must read some more Cormac McCarthy. I don’t think I’ve managed to finish any of his books other than The Road. I did go through a burst of enthusiasm for him when All the Pretty Horses came out back in the 1990s, and picked up most of his books then, and tried Blood Meridian and Horses without much joy. Thanks Tom – a great, balanced review. Glad to have been of service! Thanks for this review. I’ve just picked up John Wyndham’s “Kraken Wakes” (very interesting in the context of sea-level rise; have you read “After London” by Richard Jefferies, on a similar theme, by the way?) and this prompted me to think back to other apocalyptic novels. Thanks Martyn. Yes, The Kraken Wakes is interesting, sort of Triffids-by-Sea. I thought the stuff about how people and media respond to the crisis was as interesting as the crisis itself. Funny you should mention After London, as I know I’ve read about it somewhere very recently, but I’m damned if I can remember where. In fact, I think that is probably what Wyndham was writing about. His crises were never the stuff of pulp SF, but were somehow all the more real because of their low-key nature. I reckon he didn’t want to distract readers from the more important things, the social aspects that you refer to: what happens when the most normal and predictable of societies is confronted by the unpredictable? It was here John, I mentioned After London in the context of a discussion in your comments section about the impact of epublishing, noting that I had an ecopy but had ordered a POD version anyway as I was enjoying it and there are still real benefits to the printed word. Kraken is one of my favourite Wyndhams, it has a marvellous sequence at a dinner party, where some worldy-wise couple condescendingly explain how it’s all the work of the Soviets and that the protagonists are naive to believe what the papers are saying. All against a backdrop of blatant alien incursion and apocalypse. It may be cosy, but as catastrophes go I found its images of waters lapping up an abandoned London, and of an alien invasion in which we are outclassed to the point that they barely bother interacting with us, very powerful. On McCarthy, the only one I’ve read was No Country for Old Men, a couple of years back now I think. That was very good, so that may be worth your giving a go. Is this Wyndham with tongue in cheek? I suspect so; but this was the 1950s after all. At the moment I’m working on a series of reprints of Bertrand Russell from the same period. I have a great respect for him as a common-sense thinker, but his take on Communism, and Communist Russia in particular, verges on the rabid. Incidentally, Russell’s approach to women is one of ignoring them. His thoughts on education, for example, are without exception directed at “the boy”. Compare this to Wyndham, in whose novels the women are always by far the brighter, more cogent thinkers. Was Wyndham a proto-feminist? I think it’s definitely satirical, of dinner party conversation, of those who think they’re plugged into some ral truth the rest of us are too dumb to see, of a certain kind of English insularity too. It works in part because as a reader you know of course how wrong they are but as characters within the fiction they are infuriatingly sure of how right they are. In the interests of full disclosure though, I have a great love of Wyndham’s work, and the idea he might have been a proto-feminist I think might well have some truth in it. Just finished this, JS, and really really enjoyed it. I do like my apocalypse/last days novels, and this, although imbued with the ‘cosiness’ referenced above, genuinely packs a punch. Thinking a little too much about it last night was a rather worrying experience. As always, grand stuff sir. It seems I was misremembering my titles, what I remembered as The Trees was The Genocides, so I have read it. Profoundly depressing novel. Worth reading for the final paragraph alone. Extraordinarily bleak stuff.